Be the first to share your favorite memory, photo or story of E.B.. This memorial page is dedicated for family, friends and future generations to celebrate the life of their loved one. E.B. Brown, age 81, of Murphy Brown Road, Williamsburg departed this life on Sunday, November 25, 2018 at the home of his sister in Barbourville. He was born on May 26, 1937 in Knox County, Kentucky to the late Murphy Brown and Fredia (Syme) Brown. He was also preceded in death by his wife Wanda Sue Brown; son, Rusty Brown; brothers, Rev. Denver Brown and Fred Brown and sisters, Flora Terrell, Barbara “Jerry” Wilber and Lois Jackson E.B. was a member of Youngs Creek Baptist Church. 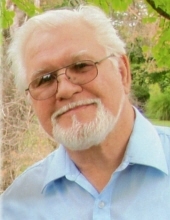 He is survived by his two daughters, Lora Cureton of Williamsburg and Brenda Cox (Rick) of Bromley; five sons, Eddie Brown of Hamilton, Ohio, Randy Brown of Covington, Ohio, Rick Brown of Middlesboro, Dewayne Brown (Mary) of Keavy and Ronnie Brown of Cincinnati, Ohio; 32 grandchildren; multiple great grandchildren and great-great grandchildren; two sisters, Carol Cooke of Barbourville and Stacie Robbins (Bob) of Webster, Florida; brother, Rev. Ted Brown (Linda) of Owenton; wife of 19 years, Dorothy Brown of Cincinnati, Ohio; and a host of other family and friends to mourn his passing. Visitation will be from 11:00 A.M. until the funeral hour on Wednesday, November 28, 2018 at Croley Funeral Home. The Funeral Service will be at 1:00 P.M. Wednesday, November 28, 2018 at the Croley Funeral Home Chapel with Rev. Leonard Siler, Rev. Roy Sutton, Rev. Ted Brown and Rev. Ronnie Cook officiating. Following the Service he will be laid to rest in the Browns Cemetery on Harps Creek. Military Graveside Services will be conducted by the American Legion Post #88 of Corbin. To send flowers or a remembrance gift to the family of E.B. Brown, please visit our Tribute Store. "Email Address" would like to share the life celebration of E.B. Brown. Click on the "link" to go to share a favorite memory or leave a condolence message for the family.